Celebrity Cruise Line have just revealed the design for their first new ship in six years, and it looks set to be their most exciting yet. Collaborating with A-list global designers, Celebrity have pushed the boundaries of what it means to be a cruise ship, creating a new level of luxury sea travel. Internationally-renowned interior designer Kelly Hoppen MBE and architect Tom Wright, who designed Dubai’s Burj Al Arab, are both members of the team that has made this visionary cruise ship a reality. Unveiling the new 117,00-ton Edge Class flagship at parent company Royal Caribbean’s new 3D Innovation Lab in Miami, Celebrity CEO Lisa Lutoff-Perlo said: “Celebrity Edge is a transformational ship”. Accommodation is one of the main areas where the new Celebrity Edge will excel, redesigning its new staterooms to be bigger, better, and more luxurious. One of the main focuses of the team was on bringing the outside in, letting cruise travellers get closer to the stunning vistas rolling past their windows. It is with this aim in mind that the concept of the infinite veranda was born, allowing guests to get right up to the water’s edge and adding an extra 20% to the floor space of the staterooms. 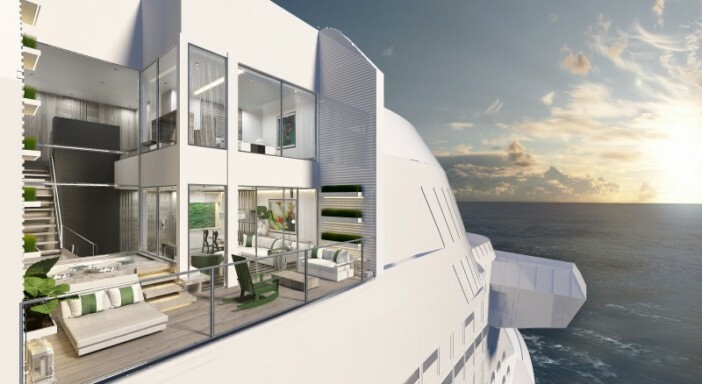 The cabins have been expanded right to the edge of the ship, with glass windows that retract at the push of a button to let in the sun from all sides. This feature is more innovative than you may think, as balconies are used to distribute the weight of the boat, and moving them indoors requires a feat of engineering. 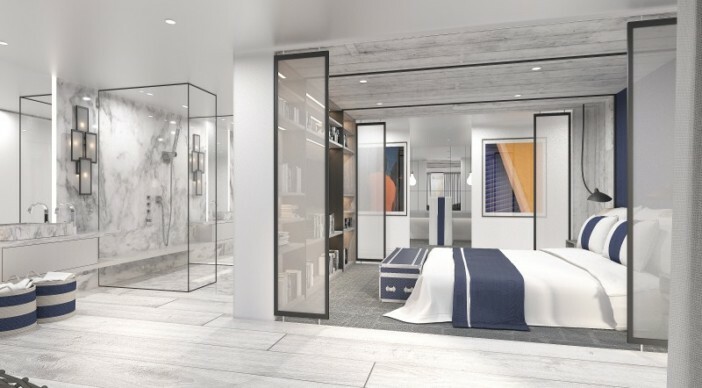 Suites with a range of features will make up 12% of the total accommodation on Celebrity Edge, compared to just 5% on other Celebrity cruise ships. This will include six stylish duplex villas, with modern décor and private plunge pools, as well as direct access to one of the ship’s exclusive sun decks. Eucalyptus-treated cashmere mattresses, a previously unheard of addition, will adorn the bedrooms, and Bulgari bath amenities, butler service, and a personalised bar will be just a few of the luxuries on offer. Designed to look like a beautiful hotel room that just happens to float from one spectacular destination to another, they really will present the best way to experience the world by sea. The Magic Carpet is perhaps the innovative feature of Celebrity Edge that has received the most attention. Designed to have a different purpose depending where it is positioned, this moveable mini-deck will travel between decks 2 and 16 acting as an additional public space. On deck 2 it will become a stylish disembarkation point, replacing the traditional gangway. At lunchtime, it will be positioned on deck 5 as an outdoor restaurant with panoramic views. 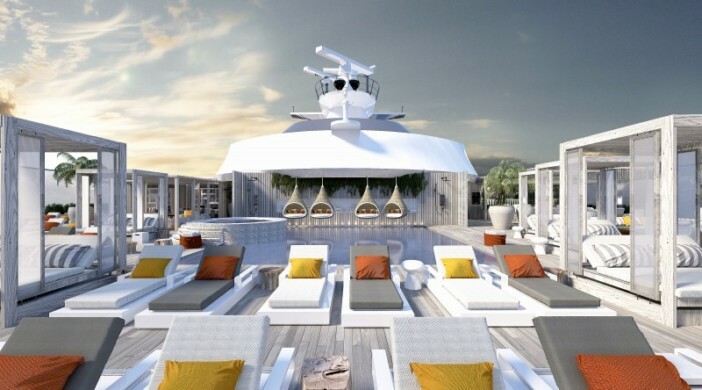 Sometimes, it will be positioned on deck 14 as an extension of the pool area, featuring a DJ for pool parties. On an evening, the Magic Carpet will be positioned on deck 16 and become a fine dining restaurant, for romantic dinners under the stars. Celebrity Edge will be making its first sailing on 16 December 2018, and be joined by three sister ships in 2020, 2021, and 2022. A variety of seven-night itineraries are planned for this beautiful new ship, including both Eastern and Western Caribbean cruises. Bookings are now open for this amazing new shi’s inaugural cruise tours, so why not book your place on the amazing Celebrity Edge today and experience touring the Caribbean in cutting edge luxury. You can also book over the phone, just give our friendly sales team a call on 0808 274 6777. Celebrity Cruise Line have just revealed the design for their first new ship in six years, come and take a sneak peak!